Latvians have resoundingly rejected the option of making Russian the country's second official language, results from a referendum indicate. About two-thirds of those registered voted, the election commission said, many more than in previous polls. The referendum, initiated by a Russian speakers' movement, has exposed deep fault-lines in Latvia. Ethnic Russians, who make up about one-third of Latvia's population, have long complained of discrimination. But many ethnic Latvians believe the referendum was an attempt to encroach on the country's independence. It was initiated by the Russian-speakers' movement, Native Tongue, which collected signatures from more than 10% of voters to force a ballot. Officials said that with more than 90% of votes counted, 75% of votes cast in Saturday's referendum were against the proposal. Turnout was about 69%, which officials say was considerably higher than expected. But many Russian-speakers resisted, and some 300,000 remain without citizenship, which means they cannot vote in elections, hold public office or work in government institutions, the Associated Press reports. "I think that over the past 20 years Russian residents of Latvia have been humiliated by authorities, by endless attempts either to assimilate or make them second-class citizens," Vladimir Linderman, co-chairman of Native Tongue, told AP. "So this is our answer." The referendum has been described as "absurd" by Latvian President Andris Berzins, who said most people were more concerned with the country's recovery from a severe recession. 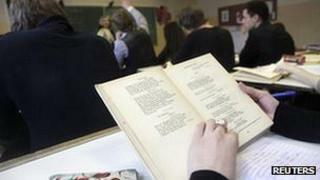 He pointed out that the government funds own-language schools for minority groups such as Russians. "There's no need for a second language. Whoever wants, can use their language at home or in school," he said. Latvia gained independence from Moscow in 1991 after half-a-century of Soviet rule. It joined the European Union in 2004.